Over the last few years I’ve answered a lot (over 800!) of Bootstrap questions on Stack Overflow. Frequently these questions relate to the Bootstrap grid __ that powerful blend of containers, rows and columns that make responsive layouts possible and flexible with Bootstrap. How do the different grid sizes (or breakpoints) work? Why does Bootstrap have a 12 unit (columns) grid? Can I have more than 12 columns in a single row? Why does the row have a negative margin? It doesn’t take much time before Bootstrap newbies feel at home with the grid. Here’s the HTML markup we’d use in Bootstrap to make a simple 2-column Web page layout. <div class=”container-fluid”> — full-width container that spans the entire viewport width. <div class=”container”> — fixed-width container centered in the middle the viewport. The container scales down in width responsively so that it eventually becomes 100% width (the same as container-fluid) on smaller devices. Bootstrap containers (.container or .container-fluid) work in close partnership with the .row and .col-* (columns) to create “the grid”. Inside the container, the .row class is used to contain the grid columns. Rows should always be placed inside of a container (.container or .container-fluid) to ensure proper spacing (between page content and the edge of the browser). If you don’t put a row inside a container, the row will be wider than the width of the viewport, causing a horizontal scrollbar. The Bootstrap .row uses negative margins (-15px) to counteract the padding (15px) of the container. The end result is no visual spacing (margin or padding) on the sides of the row within the container. There are several reasons why the “negative margin” approach is used in Bootstrap. Why does Bootstrap use negative margins? All grid systems have spacing or “gutters” around columns. In the case of Bootstrap, the gutter is created using padding of 15px around each column. The effective gutter displayed between neighboring columns in 30px. The outer columns (leftmost & rightmost) need to have 1/2 of the gutter (15px) on the outside to keep spacing consistent. Instead of using a specific class like `.first` or `.last` on those outer grid columns, Bootstrap uses negative margins. This evens up the gutters of the leftmost & rightmost columns with the outer edge of the container .row. The “negative margin” approach isn’t just a gimmick. Some grid systems instead adjust the padding (or margin) on the first/last columns using CSS child selector logic. But, as you can see here this doesn’t work well since the first & last columns rendered visually, can be different than the actual first & last columns in the HTML markup of any given row. There are other reasons Bootstrap uses the negative margins including simpler CSS, nesting and column wrapping which is discussed later in this article. The relationship between .container and .row is made complete with columns (col-*). Each row is divided horizontally using Bootstrap’s column classes col-*. Only columns should be the immediate children of rows. Horizontal layout across the page is relevant because screen width is an important consideration for responsive design. The visual space between each column (known as the gutter) is created with padding (15px) on the left & right side of each column. As a result, the effective gutter between the content of each column is 30px (15px on the left + 15px on the right). The first (left-most) and last (right-most) columns line up perfectly to the edge of the row thanks to that negative margin discussed earlier. Why does Bootstrap have 12 columns? The reason Bootstrap has a 12-unit grid (instead of 10, 16, etc..) is that 12 evenly divides into 6 (halves), 4 (quarters) and 3 (thirds). 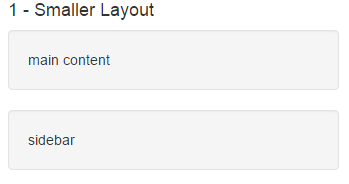 This makes adapting to a variety of layouts much easier. Bootstrap’s grid columns are identified by different col-(breakpoint)-(units) CSS classes. So for example, col-md-3 would be a column that takes up 3 of the 12 units (or 25%) across in a row. To enable or “set” a column width in your layout, simply use the appropriate col-*-* class in your HTML markup. The columns consume a percentage width of the parent container. In addition to the concept of column width, Bootstrap has different “breakpoints” or grid sizes. 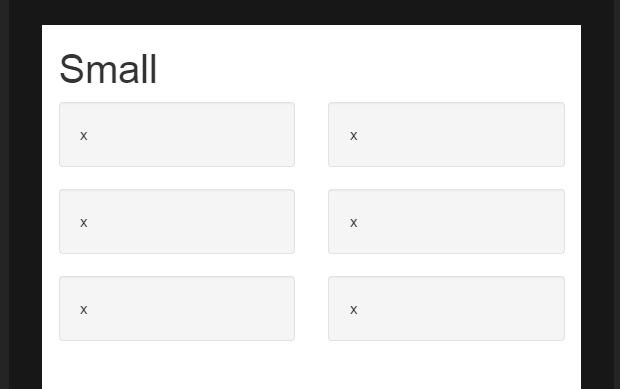 The Bootstrap 3 grid comes in four (4) sizes to accomodate different screen (or viewport) widths. Each grid “size” encompasses a range that is designed to best-fit typical device screen widths such as that of desktops, laptops, tablets and smartphones. Bootstrap uses CSS media queries to create responsive breakpoints that establish a boundary for each grid size. These grid sizes enable you to change the layout of columns to best match different screen widths and devices__ the essence of responsive design. The upcoming Bootstrap 4 grid will add a new xl breakpoint to accomodate the widest high-res Desktop screens. The various breakpoints are combined with the column units to create different column layouts on different devices. For example, col-md-3 would be 25% width on medium size screens, and then you could add col-xs-6 to make the same column 50% width on the smallest screens. Columns will stack vertically (and become full-width) on xs screens unless you use a specific col-xs-* class in your HTML markup. Use xs to prevent vertical stacking. The smaller grid classes also apply to larger screens unless overriden specifically for larger screens. So, <div class=”col-md-6"></div> is effectively the same as <div class=”col-md-6 col-lg-6"></div>. Therefore, you only need to use the class for the smallest device width you want to support. Here are several more examples that demonstrate various Bootstrap grid layouts using different breakpoints. As you create different responsive layouts you find that some scenarios require more complex combinations of rows & columns to make “things fit” on multiple devices. As you see in the markup, the total of column units in the row exceeds 12. This technique is known as column wrapping and it’s one of Bootstrap’s most powerful RWD features. So.. yes, it’s okay to have more than 12 units in a row. Just remember that wrapping is effected by column height, and in some cases you’ll need to use responsive resets to “clear” the wrapping content. 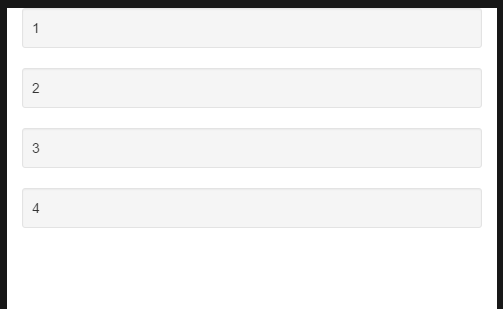 You can use a Bootstrap `clearfix` DIV every X columns, or you can use a CSS-only clear reset like this example. This allows the Bootstrap floats to be cleared and the columns to wrap to the next row accordingly regardless of height. The offset feature of the grid enables you to move columns to the right, or create more whitespace to the left. This comes in handy when you want a narrower centered layout. Here’s an example of 2–33% width columns (col-*-4) that are centered by moving the first columns over 2 units (col-offset-md-2). Many scenarios require that columns inside columns, and in this case our columns become the containers. Bootstrap allows us to nest row and col-* inside other col-* which enables more control over when columns stack vertically at specific breakpoints. When nesting, always remember to use another row around the inner columns to ensure proper spacing/padding. Also inner rows shouldn’t exceed 12 columns. While you can use nesting to change the position of columns on different devices, you can also use Bootstrap’s push and pull classes. Often, the vertical stacking of columns is desired on smaller screen devices (tablets/phones) where horizontal space is limited. A typical 2-column page layout is where we can see the most common use case for column ordering. Using the Bootstrap col-*-push-* and col-*-pull-* CSS classes we’re able to utilize the column ordering feature of the Bootstrap grid. On small (mobile) screens we want to show our main content at the top and then the sidebar nav below. This also helps SEO as the main content is closer to the top of the page when Google bot indexes the page. An important point to remember is that both nesting and push/pull classes can be used to change column order. It’s also important to think “mobile-first”. First create the markup for the desired small screen layout, and then adjust the markup accordingly for the desired large screen layout. So as you can see the Bootstrap grid is a powerful, well-considered “machine” of containers, columns and rows that enables us to build amazingly flexible responsive layouts. I look forward to the upcoming Bootstrap 4, and I will be revisiting these concepts with the new Bootstrap 4 grid which will introduce more breakpoints, CSS3 flexbox layouts and the long-awaited “equal height rows”. Originally published at blog.codeply.com on April 6, 2016.